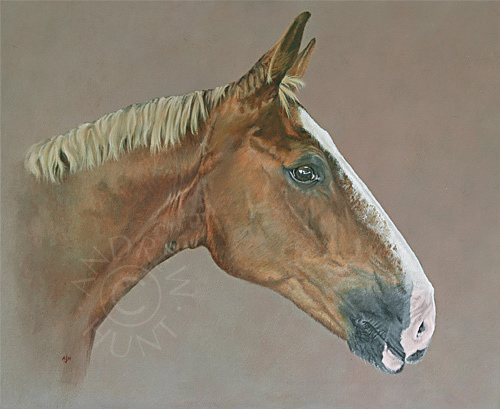 I was asked if I could produce an urgent painting of a sister's horse, for a birthday in a fortnight's time. I could easily have been too busy, but at the time I was called, it was achievable, so I agreed. She was able to supply me with a good range of clear, sharp photographs (a good looking sorrel with distinctive blaze marking) and after some discussion on adjusting some features, such as pointing the ears into a relaxed forward position, I started work on the painting, using acrylics which are quick drying and enable a faster turnaround than oils. "The painting is just beautiful - thank you so much. This really is going to be the most perfect present." Jay Jay has a lovely long blaze, graduating into a pink muzzle. As the photo with the best profile had one of his ears pointing in the wrong direction, it was very useful to be able to cross-reference a 2nd photo that showed his ears both pointing forwards. 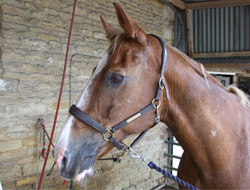 Notice too how different photos (below) can show very different hues in the horses coat, depending on the lighting. 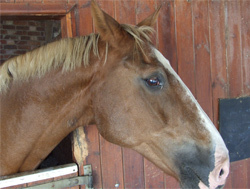 The advantage of visiting a horse personally, means I can ensure having a good grasp of their colouration.